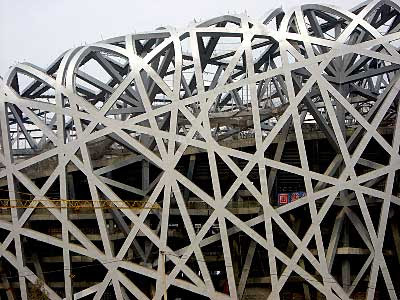 But I’ve been trying to figure out what the Beijing “Bird’s Nest” stadium really reminds me of. It’s interesting for its porosity, its irregularity, its non-Euclidean geometry. It recalls the work of artists who enclosed space in a similar way. 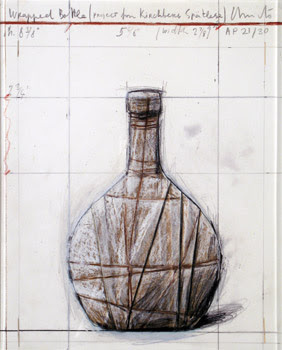 “Wrapped bottle” is from 2001-2007. 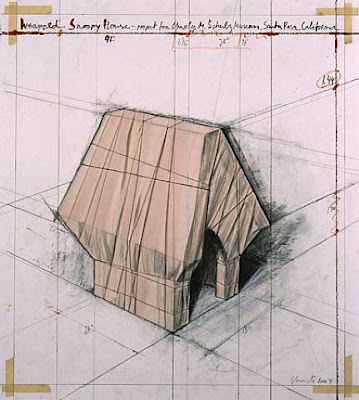 “Wrapped Snoopy House” is from 2004. And “Wrapped Paintings” is from 1969. But Christo has been sending us packages like this since the late 1950’s. Since soon after he fled his native part of the world- communist Eastern Europe. 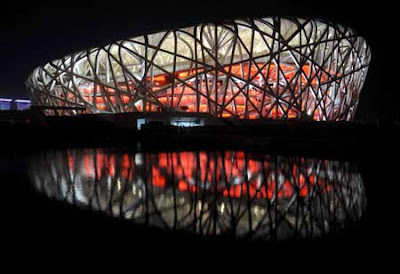 “Bird’s Nest” architects from Switzerland Jacques Herzog and Pierre de Meuron worked with Chinese artist Ai Weiwei on their stadium, not with Christo. We must bid farewell to autocracy. Whatever shape it takes, whatever justification it gives, authoritarian government always ends up trampling on equality, denying justice and stealing happiness and laughter from the people. I like his use of the word “shape.” The “shape” inside the wrapping? The truth is wrapped? Back to Christo. He grew up in autocratic Bulgaria. He was born in 1935, the Red Army occupied his homeland in 1944. They changed it from an fascist ideological regime to a Stalinist communist one. 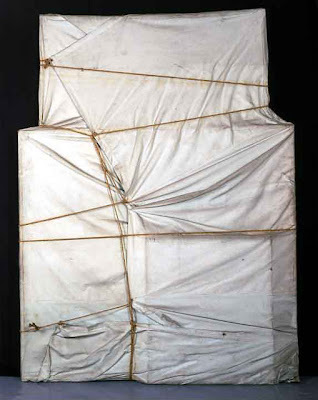 In 1957 Christo escaped eastern Europe. Is his art partly about the Communist state “wrapping” the truth? Covering up the true social conditions? He doesn’t deny this. At the Beijing stadium, does seeing the “wrapping” in such a physical form, and beautiful, which means that what’s inside might be beautiful too, does this architectural statement make us more desirous of unwrapping? Of getting at a truth, (or at beauty)? Even the pavement around the stadium is not a single entity, but is divided into pieces. Individualism. As each of the steel rods supporting this great structure is valuable, and unique. Like the words in a good poem. Like the citizens in a free society. … The “Bird’s Nest” National Stadium, which I helped to conceive, is designed to embody the Olympic spirit of “fair competition”. It tells people that freedom is possible but needs fairness, courage and strength. I’ll ask Ai Weiwei about this when I talk with him on September 17. You are currently browsing the archives for the Ai Weiwei category.